This is something gadget modder Ben Heck might have thought about, but if yes, Japanese game peripheral maker HORI (which also sells stuff in the US) was faster this time. 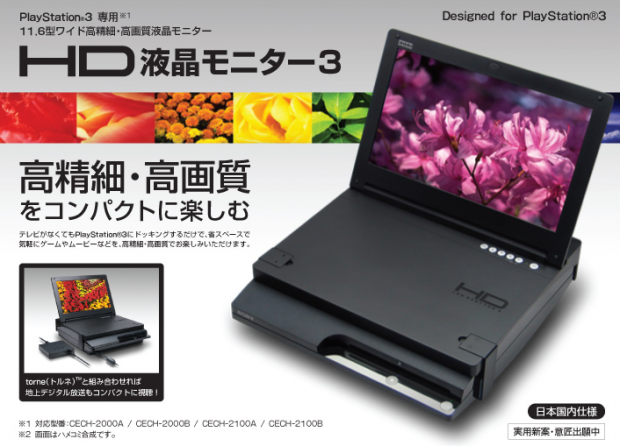 The company today announced [JP] a portable LCD screen, which, once attached to the top of a PS3 Slim, makes the console (somewhat) portable. 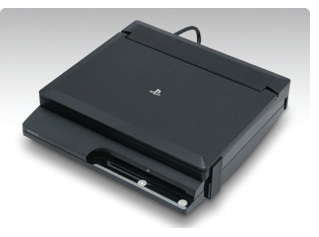 The HP3-87 will be marketed by HORI as a PS3 Slim docking station. It allows users to play games on the go (again: kind of), with images in 720p quality on an 11.6-inch screen with 1,366×768 resolution, 200cd/m2 brightness, 500:1 contrast ratio and 7ms response time. The device is also compatibe with torne, Sony’s Japan-only DVR/TV tuner for PS3. It’s licensed by Sony and sized at 295×255×55mm. Buyers also get a built-in stereo speaker, two headphone jacks, and component/ multi-AV out interfaces. Hori is planning to start selling the HP3-87 in Japan on May 27 for $280. No word yet from the company regarding an international release, but Hori says the model announced today is for use in Japan only (it can switch between NTSC and Pal though).